There are around 4,200 religions in the world. Christianity is among the 5 major world religions and it has several denominations. Among these Christian denominations are the Catholics and the Baptists. Both the Catholics and the Baptists consider the life and teachings of Jesus Christ as the focal point of their religion. Though similar in faith, there are still some major differences between the Catholic and Baptist beliefs. Continue reading this article and you’ll find out what sets the two religions apart. The term Catholic usually refers to the members of the Roman Catholic Church. It is currently the largest religious group since the time of Jesus. According to the Vatican statistics, there are around 1.27 billion baptized Catholics in the world. This is around 17.8 percent of the world population. The term “catholic” is derived from the late Latin word catholicus, which means “universal.” The Catholic belief is focused on salvation through faith and by undergoing the sacraments, which include Infant Baptism, Confirmation, Eucharist, Penance, and Anointing of the Sick. Some undergo either the Sacrament of the Holy Orders, to become priests or nuns, or the Sacrament of Matrimony, for brides and grooms. Catholics undergo infant baptism as a way to be absolved from original sin, which is the sin of Adam and Eve. During the sacrament, holy water is sprinkled or poured down the infant’s head. Also part of the Catholic faith is believing in Mary, the mother of Jesus, as well as the saints and praying through their intercessions. Catholics also believe in purgatory, which is a place of suffering where departed souls go for cleansing or purification before going to heaven. The term “Catholic” is also claimed by other denominations apart from the Roman Catholic Church. Such denominations are the Eastern Orthodox Church, the Assyrian Church of the East, the Oriental Orthodox Church, and other Protestant denominations. Baptists are those who comprise a group of Evangelical Christian churches and denominations. The earliest record of a “Baptist” church was in 1609 in Amsterdam, with a pastor named John Smyth, who is an English Separatist. The first Baptist congregation was established in North America then grew in both New England and the South. Their church spread to every continent as advocated by Baptist missionaries.The Baptist Church has an estimated 105 million followers worldwide. Their Baptist belief is focused on faith in Jesus Christ alone as the key to salvation. The term “baptist” comes from the Greek word baptidzo, which means “to dip or submerge.” They believe in the doctrine that baptism is only for those who believe in Jesus Christ and can express their belief. The act of baptism is done by completely immersing the body in water. The Baptist ideology states that since infants still lack the ability to understand and express their belief, baptism is not for them. It is only for adults or children who are able to profess their faith. Furthermore, Baptists believe that baptism does not play any part in salvation. Baptists pray only to Jesus and they do not believe in purgatory. The Catholic church currently is the largest religious group in the world while the Baptist church has a smaller following. Catholics believe that the way to salvation is through faith and in undergoing the sacraments whereas Baptists believe that salvation is gained through faith in Jesus alone. Infant baptism is practiced by Catholics. 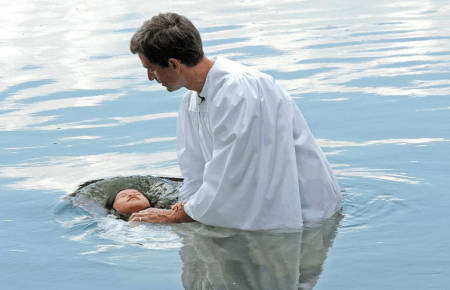 Conversely, Baptists do not believe in infant baptism. Members of the Catholic church pray through the intercession of Mary and the saints and they believe in purgatory. Baptist members, on the other hand, pray only to Jesus and discount the existence of purgatory.